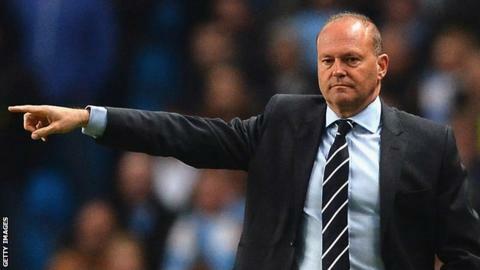 West Bromwich Albion have parted company with Pepe Mel after four months as the Premier League club's manager. The 51-year-old Spaniard won just three of his 17 matches in charge as West Brom finished 17th, three points above the relegation zone. Sporting and technical director Richard Garlick said the decision took into account events "on and off the field". The West Midlands club were 14th when Mel signed an 18-month contract to succeed Steve Clarke in January. Mel admitted on 9 May his future was in doubt, saying: "I'll meet with the chairman and see if the vision he has for the club is the same as mine." The club then suffered a 2-1 home defeat by Stoke on Sunday to round off what Garlick described as a "very disappointing campaign". He added: "Both Pepe and the club set out with the best intentions of making the appointment work. However, having reflected on events both on and off the field during our talks today, it became apparent that it was in the best interests of both parties for there to be an amicable parting. "We are grateful for the manner in which the existing coaching staff and players have rallied behind Pepe to get the club over the line in what has proved an extremely competitive division." West Brom said Mel had signed an 18-month deal when he arrived but the ex-Real Betis coach later claimed his contract was for only six months. Mel's tenure at West Brom was marred by high-profile controversies off the pitch and largely poor performances on it. The club sacked striker Nicolas Anelka on 14 March after the Frenchman announced via Twitter he was quitting The Hawthorns. Anelka, 35, had been fined and suspended for five matches following his 'quenelle' goal celebration. Mel also had to address the aftermath of a dressing room altercation between team-mates Saido Berahino and James Morrison after the 3-3 draw against Cardiff. Cardiff had snatched a stoppage-time equaliser in the match between the two relegation rivals on 29 March. Two weeks later, West Brom surrendered a three-goal lead to draw by the same scoreline at home to Tottenham. West Brom have also parted company with David Gomez, a Spaniard who was added to the coaching staff at Mel's request in February. Assistant head coach Keith Downing and goalkeeper coach Dean Kiely will remain in their current roles while the club searches for a new boss. Garlick added: "Although we have managed to achieve a fifth successive season of Premier League football, it has been a very disappointing campaign and lessons have been learned. "The search for a new head coach has now begun. We aim to find the most suitable candidate who, with the support of the structure we have had in place for six years and are presently strengthening, will enable the club to be more competitive next season."